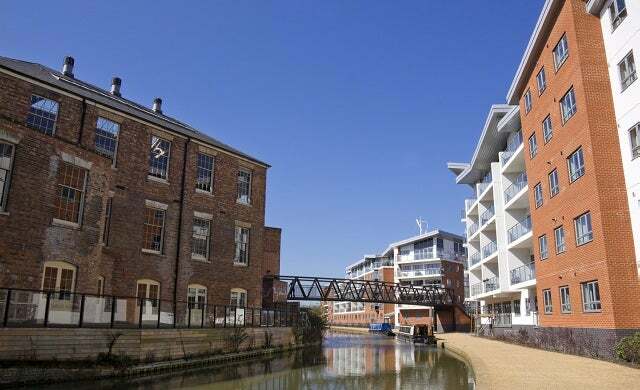 Close to the capital but with more affordable living costs and a wealth of support for new businesses, could Milton Keynes be your start-up base? Why start a business in Milton Keynes? One of the UK’s last and most enduringly successful ‘New Towns’, Milton Keynes was designed from the ground up as an environment which would nurture new businesses. Several national and international companies have based their UK headquarters here, including Argos, Domino’s Pizza, Marshall Amps and Mercedes-Benz, and though the city’s start-up scene is small, there are still plenty of reasons to set up shop. In terms of transport links, it doesn’t get much better than Milton Keynes; the city was deliberately placed equidistant from London, Birmingham, Leicester, Oxford and Cambridge in hopes of becoming a regional hub for business. Connections to the capital are particularly rapid, with London just 35 minutes away by train. International destinations are also eminently accessible through the nearby London Luton airport. Whilst the city hasn’t quite reached the lofty heights planned for it in the 1960s, it is home to a growing cluster of tech businesses looking to locate in more affordable premises than in the bustle of London. To this end, Milton Keynes offers a “Launchpad” programme for start-ups, with a package of support including free desk space for three months – an offer you will struggle to find elsewhere in the country. Milton Keynes does not have a university at present; the headquarters of the distance learning Open University institution are based here, but this is only home to around 200 full-time students. The postgraduate Cranfield University is also located in nearby Bedfordshire. The city is working to change the current dearth of institutions located within Milton Keynes. The University Campus of Milton Keynes is a small institute run by the nearby University of Bedfordshire, operating courses in business-related subjects like engineering, journalism, telecoms and computer systems engineering. It is hoped this campus will eventually provide the seed for a new, independent Milton Keynes University. Despite not having any universities, 35.5% of the workforce have NVQ Level 4 populations or above, representing a decent talent pool for start-ups to draw from. Milton Keynes College offers training courses and apprenticeships for local businesses, with the likes of Red Bull Racing, Railcare and Nifty Lifts having taken advantage of their services thus far. As you might expect for a city located so close to London, average weekly salaries are fairly high, at £557.10 on average, although this still makes recruitment substantially cheaper than in the capital itself. It may be the case that Milton Keynes has suffered from being so close to the extensive support London can offer start-ups, as business support in the city itself is somewhat lacking. Grants and funding schemes are difficult to come by in the city and, until recently, there were no start-up accelerators in the area. However, earlier this year regional accelerator programme Entrepreneurial Spark launched in the region which you can find out about here. As mentioned above, some support is available through Invest Milton Keynes’ Soft Landing offer which offers free desk space for three months in the city’s business district, networking opportunities, assistance with sourcing property, and advice and support from Invest MK. More generally, Invest MK provides a good starting point for businesses looking to locate in the region – the site and team can provide general advice and support, as well as a search tool for commercial property in the area. Business parks include Pury Hill, Caldecotte Lake, Hayfield, Woodlands and Denbigh West – to name just a few of many. Milton Keynes is also home to the Transport Systems Catapult Centre, part of a nationwide initiative bringing scientists, investors, experts and businesses together for research and collaboration on a single site. If you are a transport business looking to access cutting-edge research, you could do a lot worse. This area is where Milton Keynes doesn’t measure up quite so well; grants and funding schemes specific to the city are few and far between. No grants or funding schemes specific to the city are currently open at present – the closest you will come is the aforementioned Soft Landing initiative. However, Milton Keynes’ close proximity to London should provide some recompense for this. The extent and range of business support in the capital is unmatched almost anywhere else in the world, and by locating in Milton Keynes you will be less than 40 minutes away from accessing it. The survival rate for start-ups in Milton Keynes that were founded in 2010 to 2015 was 41.3%, which is lower than the average for the South East region in general. At an average of £248,655 house prices are only slightly higher than the national average of £183,396. This is still substantially cheaper than virtually anywhere in London, however. Crime is fairly low for a city of its size, too, at 70.57 crimes per 1,000 population. Milton Keynes is home to a number of large entertainment venues, including the 65,000 capacity National Bowl, home to a number of large-scale events each year, and the 1,400 seat Milton Keynes Theatre. Many leading band tours and West End shows stop in Milton Keynes, so residents should be well served for entertainment. The city is home to a modest but growing arts scene, with literature groups like Speakeasy meeting regularly alongside free exhibitions of international contemporary art at the Milton Keynes Gallery. Milton Keynes’ highly modernist urban planning has seen the city spread out in a grid-like formation, with a large number of trees, parks and garden squares. Opinions are divided as to whether this model has worked – getting around the city is a breeze through its well-planned cycle network and average road speeds of 33 mph, but some town planners have criticised the layout and feel of the town as soulless and boring. It is also worth bearing in mind that the attractions of London are a short train ride away. A first-hand account from an early-stage start-up on what it’s like to start a business in Milton Keynes and what the city has to offer new entrepreneurs. You can also gauge insider opinion on what more Milton Keynes needs to do to accommodate start-ups. Food marketplace Yumbles explains why it relocated from London to Milton Keynes.